Poor feet. So overworked. So underappreciated. 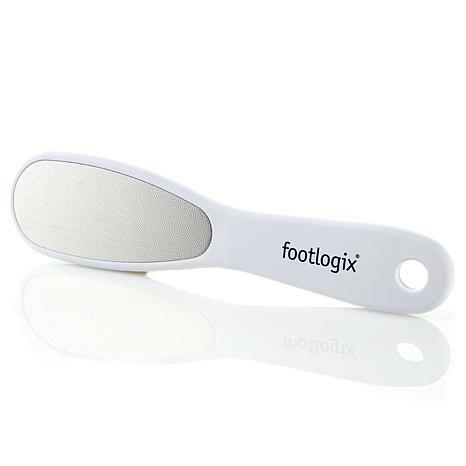 Give your feet the attention and pampering they deserve with this uniquely designed double-sided foot file. My heels have been in terrible condition for years. I'm in my late 30's, had a few health issues, and would wake up all hours with my feet stinging and burning. I have tried everything except a professional pedicure (which I cannot afford). Foot creams, stones, everything. WHAT A RELIEF TO FIND THIS! 30 seconds of gentle scrubbing & that was it! My heal is perfect with NO pain. Why isn't this file more popular? If you're not sure if this works, I'm here to tell you... IT WORKS! 1 Million Stars! I have tried many foot tools that have worked but there is nothing out there that works as well as this one. It alone does an excellent job of removing dry dead skin off your feet. The handle is strong and sturdy which the others I have used are not. Honestly once you use this no need to purchase foot tools in the stores. I never write reviews but you all need to know that this item works! I e I tried them all. its gentle, fast, effective and high quality. You will never buy another brand!! Work very well,for me better then battery operated.thank you. I have 3 of these foot files.....every time I "misplace one", (or a friend walks away with it), I immediately go to HSN to purchase another. It works so much better than any other on the market, anywhere.If you get cracked, calloused feet you absolutely need this. (Works well on rough elbows too with the smooth side of the file).